Rivette was working on this from 1957-1960. In ’57, Chris Marker did Letter From Siberia. In ’58 we had Le Beau Serge, Elevator to the Gallows and a couple shorts. ’59 brought Pickpocket, Hiroshima Mon Amour and The 400 Blows, then Breathless and Shoot the Piano Player were in 1960. So Rivette might have started everything, in a sense, but by the time he’d made his statement public (in ’61, along with Cleo From 5 to 7 and Last Year at Marienbad), the whole “new wave” was in full swing in the theaters. Betty Schneider (of Mon Oncle) is young innocent Anne with brother Pierre (Francois Maistre, later of a buncha Bunuel films). She meets theater director Gerard (Giani Esposito of French Cancan), paranoid American Philip (Daniel Crohem) and mystery woman Terry (Francoise Prevost of Rivette’s 1981 Merry-go-round). Movie gets more disturbed and paranoid (as well as loose and rambling) as it progresses, ending with the deaths of a buncha characters. Somewhat like The Dreamers. Incidentally, “Paris Belongs To Us” would’ve been a better title for that movie. Interesting parallels with Out 1, both being about theater groups and city-wide conspiracies. In this one, we never find out if the conspiracy even exists, and in Out 1, the group does exist and is partially uncovered, but the group has no sinister purpose, never even did anything together and have been long dormant. 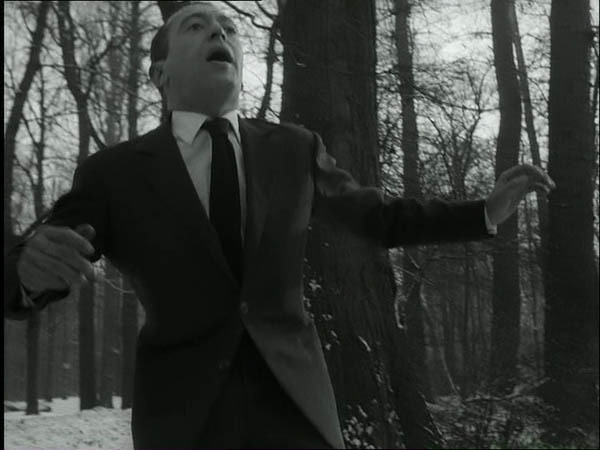 Much is made of the cameos by Godard, Chabrol, Rivette and Demy in the promo material, but I can’t say I noticed any of those. Michael Rowin in Reverse Shot calls it “a fascinating disappointment”.